Liquid Robotics’ Wave Glider, the storm-chasing, shark-tracking, ocean-crossing nautical robot, is now propelled partly by solar energy. The latest model, SV3, is the world’s first hybrid wave- and solar-power-propelled unmanned ocean robot, its makers claim. The SV3 autonomous, unmanned marine vehicle (UMV) is the big brother of the smaller SV2, which has been the company’s main model since it was introduced in 2009. The robots can operate independently for a year or more at sea without requiring maintenance and can form data gathering networks in fleets. They are often used for monitoring marine ecosystems, predicting weather patterns, and gathering environmental data, as well as conducting reconnaissance and surveillance. The robots’ unusual propulsion system mechanically converts the motion of ocean waves into forward movement, while their payloads are fueled by solar energy. The system recently won the 2013 Edison Awards Gold Medal for innovation in power generation and utilization.Now that propulsion system has been boosted with solar power. New in the SV3 is the ability to store solar energy, as well as an electrically powered auxiliary, vectored thruster. The new model’s peak payload power is 10 times the SV2’s at 400W vs. 40W, and its peak solar power is 170W vs. the SV2’s 112W. The lithium-ion rechargeable battery is the same type as the older model’s, but its 980Wh capacity is higher than the SV2’s 665Wh. The SV3’s use of solar energy for at least some of its propulsion especially intrigues me because of a discussion in the comments section of my recent blog on alternative fuels. A reader wondered why solar power isn’t used in propulsion. I replied that the energy requirements for a stationary object are very different from the energy requirements for an object that must propel itself somewhere. Aside from generating enough power to overcome inertia, there’s also the additional energy needed, such as in a car, for powering things like lights, heating, and electrical appliances via outlets. Propulsion itself takes a lot more energy than we moderns may realize, having gotten used to the combustion engine and the “horseless carriage,” and solar energy density isn’t high enough.But it’s getting higher for collectors used on stationary buildings: Tokelau, a three-island Pacific nation, recently went 100-percent renewable using solar as its primary source of electricity, with biofuel as a backup. Liquid Robotics isn’t telling us how it converts and stores solar energy, but I suspect the amount contributed to propulsion isn’t huge. The surfboard-sized robots weigh as much as very large adult man: 122 kg (270 lb) for the SV3 and 90 kg (200 lb) for the SV2. At 290 cm x 67 cm (114 inch x 26 inch), the SV3’s float is larger than the SV2’s, which measures 210 cm x 60 cm (83 inch x 24 inch). The new model’s float has three solar panels for powering the onboard electronics. Its power system and payload can be changed by swapping out modules in its compartments. According to a press release, the “modular” power system allows power generation from other sources, such as wave-to-electricity generators and fuel cells. The float is connected to the submerged propulsion system by a high-bandwidth umbilical tether 4m (13 ft) long. The propulsion system can power and communicate with an underwater payload via an expansion port. The SV3 is about twice as fast as the older model. Both models are acoustically silent and have low visual and radar signatures. The new Wave Glider comes with an RF tracking transponder, an AIS (Automatic Identification System) marine traffic antenna and receiver, an independent auxiliary iridium tracker, an active radar reflector, wave height and water speed sensors, a weather station, and a visibility mast with flag and light. 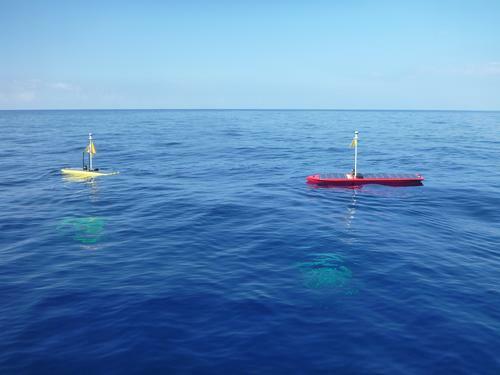 It’s also equipped with additional capabilities, such as onboard, real-time data processing of large datasets, called [email protected], as well as a new adaptable operating system called Regulus that’s been designed to accommodate intelligent, autonomous fleets of SV3 Wave Gliders. Other Wave Glider models include the METOC (Meteorology and Oceanography); the SHARC (Sensor Hosting Autonomous Remote Craft), which is acoustically silent, with low visual and radar signatures, and designed for defense and national security applications; and the lower-cost GATEWAY for monitoring, control, telemetry, and data extraction of undersea equipment and instrument, such as weather data.